As suggested by its name, Peregrine PlainsMaster reloading bullets, is Peregrine Bullets’ answer to hunting when a flatter trajectory over a longer range (up to 650 yards in .308 caliber or less) is required. 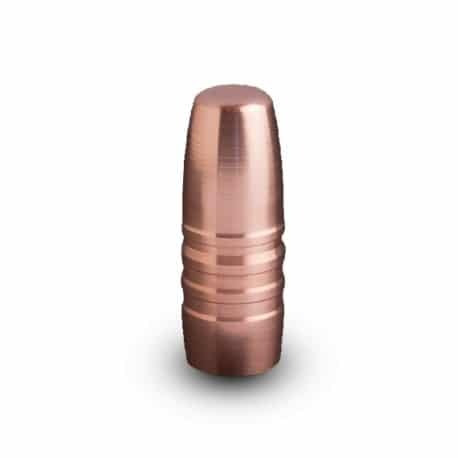 These bullet tips consist of a soft red copper design, equipped with a brass expander plunger. The Peregrine PlainsMaster’s excellent ballistic coefficient (BC) results in a flat trajectory providing pin point accuracy. The patented brass plunger can be expected to mushroom the bullet to two diameters predictably, reliably, consistently, and over various impact velocities. The Peregrine PlainsMaster’s plunger design mushrooms the bullet upon impact, even when impacting targets at velocities as low as 1 600 f/s. Meat damage is very limited since Peregrine Bullets don’t disintegrate upon impact, but deliver most of their energy in the targeted animal whether impacting bone or flesh. Peregrine Bullets offers a ballistic equivalent, Peregrine Match Bullet (VRG5), as a complementary companion to the Peregrine PlainsMaster. Peregrine Match differs from the Peregrine PlainsMaster in that it is a solid monolithic, red copper bullet, which is ballistically equivalent to the Peregrine PlainsMaster. The Peregrine Match reloading bullet can therefore be utilized as a less costly alternative for load development, target shooting or competition shooting. The fact that Peregrine Bullets offers these two bullets as ballistically complementary equivalents, is a service unique to Peregrine Bullets. The Peregrine PlainsMaster boasts consistent, predictable expansion and weight retention independent of velocity or target animal. Velocities between 3400fps down to 1600fps have reliably been tested over the years. Due to its unique driving-band design, the PlainsMaster provides increased velocity, while offering less recoil and reduced pressure on the barrel and chamber. The softer material used serves to enhance barrel life in hunting rifles. This bullet will not fail, fragment or bend. The PlainsMaster is customized for reloading. The PlainsMaster retains 90% or more of its weight upon impact, and, as a result of the solid mushroom formation, which dumps most of its momentum and energy into the target animal. This bullet is ideal for hunting over the medium to long range (up to approximately 650 yards for calibers under 308). The 338 has a kill-range of over 1000 yards. The brass plunger works on the principal of pneumatic expansion. Trapped air hyper-compresses upon impact, resulting in explosive expansion. This patented plunger design is unique to Peregrine Bullets which is why Peregrine Bullets can expand at lower impact velocities. As a result of its lower weight in comparison to lead-bullets (approximately 10% – 15% lighter for the same form-factor), the Peregrine PlainsMaster achieves a higher velocity, reduced recoil and high energy transfer.